1855 Tinted Lithograph from the Pacific Railroad Survey . Print Type:...Tinted Lithograph - a lithograph printed from 2 or 3 stones, one producing the details of the image in black ink, and 1 or 2 others providing some wash-like coloring (typically fawn, blue, green or gray). Print Date:...1855. This lithograph is 146 years old; it is not a modern reproduction. Print Title: View of Sangre de Cristo Pass, Looking northeast from Camp north of Summit, Aug 11th. Artist:...John Mix Stanley (1814-1872) from a sketch by Richard H. Kern (1821-1853). Richard Kern was actually the artist of the Pacific Railroad Survey at the 38th and 39th parallels; he was the one who made the original drawings and paintings. Because he was killed in October, 1853 by Ute Indians in Utah, John Mix Stanley prepared the images for lithography. 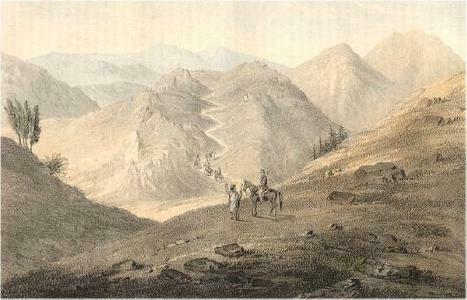 Stanley, a noted artist himself, was artist to the northern route of the USPRR Survey under Gov. Isaac Stevens, that explored the area between St. Paul and Puget Sound. Lithographer: A. Hoen & Co., Baltimore. Image Size: 8 3/4 x 5 3/4 inches. ~~~~ History:...In 1853, the U.S. Congress authorized the Corps of Topographic Engineers to undertake a survey of potential rail routes between the Mississippi River and the Pacific Ocean. 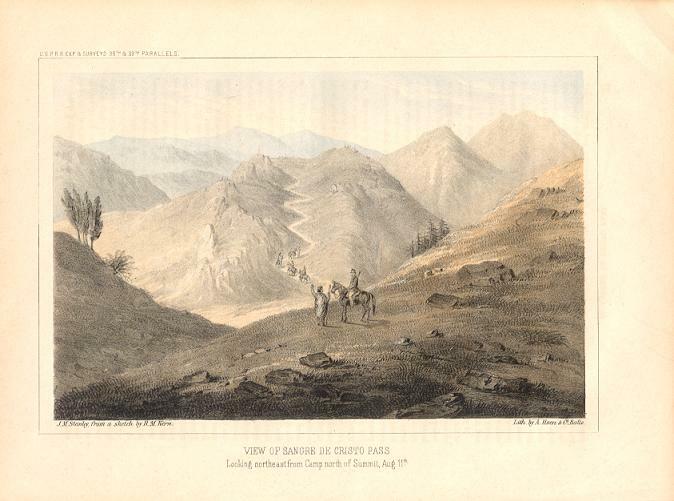 This print is an illustration from the report of the survey at the 38th and 39th parallels under the leadership of Captain John W. Gunnison, assisted by Lt. Edward G. Beckwith, who surveyed routes in Kansas, Colorado and Utah. Gunnison, Richard H. Kern, topographer and artist to the expedition, and seven others were killed by Ute Indians along the Sevier River in Utah. Beckwith assumed leadership and the survey explored routes at the 41st parallel which Beckwith (and Gunnison before him) recommended as an economical and practicable route. Although this suggestion had little influence at the time of the survey, the first transcontinental railroad completed in 1869, when the Union Pacific and the Central Pacific Railroads were joined at Promontory Point, Utah, basically followed Beckwith's route. The CPRR Museum and Panzoom are not affiliated.